The International VDI Congress "Dritev - Drivetrain for Vehicles"
In light of the technologial upheaval phase that the powertrain is currently undergoing we could once again witness at this year’s DRITEV how important the exchange of views with OEMs, suppliers and universities at a high technological level is. In addition to all the challenges that the world markets see themselves faced with - posed by the electrification and hybridisation of drives - one of the key objectives remains to be able to refine and enhance existing technical solutions down to the smallest detail. Being the conference chairman I noticed at this year’s conference how much the DRITEV is nourished by the high level of expertise lectures and their subsequent debate. In-depth discussion, ample opportunity to share views with fellow participants and the accompanying trade exhibition are key elements that make the congress a fantastic place for forging new ideas and innovations. The program committee and myself are already looking forward to the DRITEV 2019 and the large number of lectures that will hopefully be submitted following this „Call for Papers“ ; as done every year, we are eager to compose an attractive congress agenda with interesting topic fields. Thank you very much and see you in Bonn! Hereby we inform you that11 th International exhibition of, Metallurgy, Steel, Foundry, machinery and related industries, September, 01-04, 2019, will be held in Isfahan, Iran. Following the last successful event, we are pleased to announce that the important and key personnel Iranian people at this sector will participate in this event. This Golden opportunity is dedicated to following a path towards sustainable development of the Iranian metallurgy and steel industry. Isfahan province is the most important province of Iran in Steel manufacturing and Metallurgy sector. The main steel producer companies of Iran including Mobarakeh Steel Company and Isfahan Steel company and many other foundry plants are located in this region. Mobarakeh Steel Company is the biggest steel producer in Middle East and Northern Africa and the biggest DRI producer in the world. Esfahan Steel Company another import company, is the 1st & largest constructional steel & rail producer in Iran and the biggest producer of long products in the Middle East with 3.6 Million Tons capacity per year. 10th International exhibition of Steel, Metallurgy, Foundry, machinery and related industries with the presence of 120 companies and with 218 booths, in an area of over 7000 square meters was successfully held in 2018. Regarding all these facts this exhibition is golden opportunity for domestic and International companies who are interested to make business in Iran market in this field. We would like to warmly invite you to participate in this event and join us. Internationally recognized and recognized as the best and largest foundry fair in Latin America, FENAF 2019 – Latin American Foundry Fair is the great opportunity for companies to show their products to professionals in the industry in a global way. Business fairs are, admittedly, the best showcase for companies to increase their visibility. Participation in fairs is an effective means of communication where the concentration of the public with the same focus and similar interests is one of the most advantageous points. The opportunity for direct contact with current and future clients and partners strengthens the relationship and promotes time savings and, consequently, financial savings. Industry fairs, such as FENAF, facilitate the knowledge and updating of market information. During the four days of the Fair, visitors and entrepreneurs will be able to check the news and get to know the new trends and technologies for the sector, gathered in a single large exhibition space. Come and join FENAF 2019! One of the main functions of the WFO is to unite the industry and disseminate appropriate information in a standardised and systemised manner at an annual event. To this end the World Foundry Congress, is held bi-annually for the presentation of technical papers and providing an adequate networking opportunity for those wishing to have a thorough understanding of the latest research and developments in the cast metals industry. In addition there are social events for delegates and their partners. On behalf of the Polish Foundrymen's Association and Co-organizers, we would like to invite you to take part in the II International Conference of Metals, Ceramics and Composites. The main goal of ICMCC 2019 is to establish a new international platform for sharing and exchanging knowledge in a successful implementation of material science related laboratory trails to real industrial applications. The special emphasis will be put on a recent progress in technologies associated with fabrication and processing of metallic, ceramic and composite materials also regarding their impact on sustainable economy. 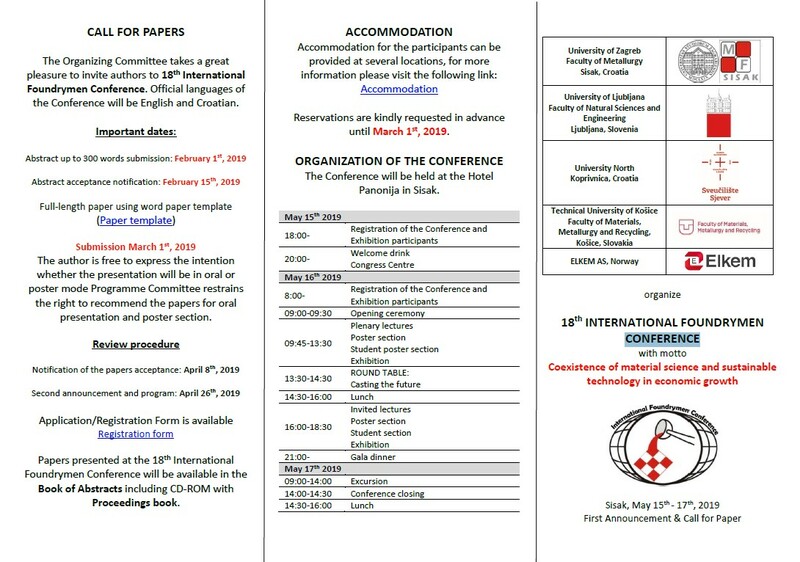 On behalf of the Faculty of Foundry Engineering of AGH University of Science and Technology in Krakow and Polish Foundrymen’s Association, we would like to invite you to take part in the II Intermational Conference of Casting and Materials ICCME 2019. The Conference will take place on November 8th 2019 in Swing Hotel in Krakow, Poland. It is devoted to Automotive Industry. Der Leichtbaugedanke ist seit jeher immanenter Bestandteil der deutschen Ingenieurskunst. Um nachhaltig den Technologievorsprung zu festigen und die Produktion am Hochlohnstandort Deutschland zu erweitern, gilt es, innovative Lösungen für mehr Effizienz entlang der gesamten Wertschöpfungskette einzusetzen. Die fortschreitende Digitalisierung als auch differenzierende technologische Maßnahmen sind dabei wesentliche Erfolgsfaktoren im globalen Wettbewerb. Die „Leichtbau in Guss“ beschäftigt sich 2019 schwerpunktmäßig zum einen mit den nationalen und globalen Herausforderungen in der Gießereitechnik – Vorträge, zum Player China und zum Thema Produkthaftung, beleuchten dies näher. Zum anderen werden neueste Entwicklungen in Prozesssimulation und –überwachung als auch Innovationen bei Werkstoffen und Verfahren vorgestellt.